Customizer Spotlite: Pulse | Doll-Lite! How did you get involved in Super Dollfies and customizing them? 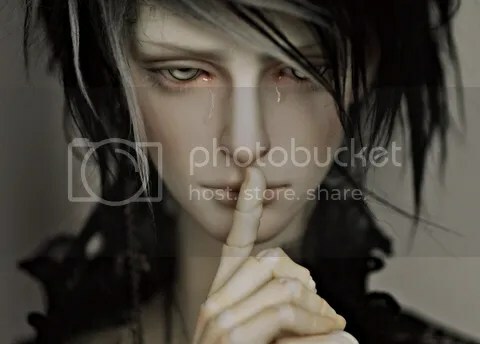 I actually found out about BJD looking through a Korean trends site a few years back that had a ton of Luts photo but I lost interest until a few years later. Painting dolls was something I had never done before so I suppose I started painting them out of pure curiosity when I first got one. What do you want people to think when they look at your Customizations? Generally I’d like them to see my works as something beautiful. If they had the faceup commissioned personally, ideally I’d want them to see exactly what they wanted. What sorts of things do you enjoy the most about your designs/customizations? I like that I get to paint a lot of different “personalities” so to speak. I can paint a cute boyish personality but then paint the same mold covered in scars and bruises. It’s fun. Other than yourself, who are your favorite doll customizers? What’s the Best thing about customizing your own dolls? Having control over the most noticed and praised part of the doll. What’s the most difficult thing about doing face ups and altering them? I would say getting the consistency of the lining right. If I make a mistake I can’t lightly rub away with the eraser, I have to start the entire thing over in most cases. I have a tendency to have to do things without error so it’s time consuming at times. What type of dolls do you enjoy customizing (male/female/brands)? I actually prefer painting male molds, they have more character to their face in most cases. Oddly, I feel as if I haven’t perfectly executed a feminine faceup yet. When it comes to specific brands I enjoy painting Alice in Labyrinth, Dollshe, Minimees, and Volks molds. But honestly, if the mold isn’t too animated looking, I’d probably love painting it regardless of who the maker is. SDink, I’d love to take photos of one her Dollshe Saints with mine! Why choose doll customizing as a form of Self Expression? It’s just something I enjoy. How long does it take from start to finish on a typical doll to create and complete? Because of time constraints it can take me several weeks but put that time together it’s probably only a few days to a week. I like knowing the hair colour so I can get the eyebrow shade right but other than that, if I have free reign, I usually produce the best faceups. But that’s not what happens most of the time so usually for customization requests I like when they tell me what they want and what they do not want. Then I’ll paint making sure to include the things they requested but still having my twist on it somewhere. What have been your favorite projects you’ve done thus far? I haven’t done anything extremely extensive yet but I liked painting and modifying my Williams. Sanding down his nose was an experience for sure, I felt I would mess it up at any moment haha. What sets your doll customizations apart from all the others? Are there any sort of projects you’ve been hoping to work on but just haven’t gotten around to it? Of course. I want to make my own custom doll. What was the most challenging thing you have ever done thus far? How has your style evolved over time, and where do you see it going in the future? Describe your perfect client. Do you like to get a lot of direction, or just be given a general mood, or do you like to see visual examples? Hm, it’s hard to say. A perfect client would probably someone who I have painted for multiple times. So even if they give me confusing instruction, I know their tastes enough by that time in order to create something they’d like. But generally, a perfect client would be a patient one who allows me to paint with few constraints. Of all the faceups you’ve done, do any stand out to you in particular? Howso? I’m fond of all the faceups I’ve done in one way or another.